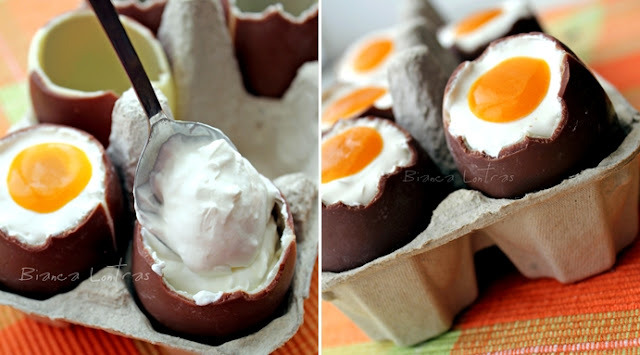 We celebrate Easter this coming Sunday and I remembered that I saw on this blog some while ago these awesome filled chocolate shells and it gave me the idea with the Kinder Eggs. Kids will love this sweet treat, I'm sure :) There is no baking involved, so you might as well get the kids help you making them. I used a tiny bit of yellow food coloring, just to bust the color. In a small saucepan heat on low the jam and butter, until the butter is melted. Set is aside to cool (when was cold I added a dash of yellow food coloring). Place it in the fridge. Place the eggs in an egg carton, or your fridge egg holder and keep them in the fridge, while you prepare the filling. With a hand mixer beat together cream cheese, sugar, lemon juice and vanilla essence for a couple of minutes. In a separate bowl whip the cream until stiff and then gently fold it over the cream cheese mixture and combine until smooth. You can fill the eggs with the mixture now, using a tea spoon or you can pipe it (then level the top to look more realistic) and place the yellow mixture for the yolk. Keep it in the fridge for at least 30 min. Happy Easter! Pin It Now! Foarte ,foarte frumos totul.Prezentarea e de vis,imi place tare mult. Multumim, Angelica! Paste Fericit si tie!